Photo submitted by mat grant recipient Liz Corwin, left. Find her story below. For the past six years I have been volunteering time teaching yoga in underserved communities. This journey began in a class with veterans at the Denver VA hospital, while my son was serving on a tour in Afghanistan. I never could have guessed how these hours would become transformative to my own yoga practice. They have filled me with appreciation for all aspects of my own life, my son’s life, and the lives of the people I have met on the mat. I currently teach yoga at the Boulder County jail and adaptive yoga in an Imagine group home and at a Boulder retirement home. This work is so rewarding; I am constantly surprised and delighted by all of my students. To see each individual’s willingness to try, with obstacles I cannot begin to understand, makes me feel fearless and inspired. It can be tiring and difficult and sometimes feel thankless, but the personal rewards are great and many. I find that this work returns to me gifts in equal measure to what I offer each of the populations I practice with. I share the practice of yoga with people I might otherwise not have known, so we all grow in our ability to see past our differences. It’s as if I am gazing into a mirror, and able to see our shared humanity. In March of 2015 I was asked to manage the Give Back Yoga Foundation’s Mat Program. Through the generosity of Gaiam, this program has provided yoga mats for underserved populations in many parts of the world. The stories and submissions for all of these mat requests reflect the compassion people have for one another, and the ability yoga has to heal and connect people locally and globally. The yoga mat grant program started with a request for mats for several Boulder County high schools, a request from a veterans’ yoga program, and a handful of other people in need of mats. Gaiam willingly and generously offered to contribute 2,500 mats for the year to this program. Halfway through 2015, we’ve distributed over 1,900 of these mats to populations ranging from refugees to homeless people, from Native Americans to veterans serving overseas. Other populations to whom we have sent Gaiam mats include caregivers, survivors, first responders, people with eating disorders, and people in recovery from addiction. We have even sent mats out to “Cowboy Up,” an equestrian program for veterans which now incorporates yoga classes. While some of the programs require confidentiality and are not able to share photos with us, many have submitted photos of participants practicing on their new mats. Photos and thank you messages are shared each Monday on Give Back Yoga Foundation’s Facebook page, and the images tell stories beyond words. I’m also blessed to read extraordinary submissions like the ones below, which enrich my days working as the program coordinator. I am deeply moved by the generosity and strength of the human spirit of all of these yogis who come out and practice yoga no matter the difficulties they face. I am just as moved by the the people who have put all these programs in motion. Most of them offer their commitment to these programs as volunteers, so hats off to them! And hats off to Gaiam, too, for helping to make this program possible. It is my belief that giving is one of the most gratifying aspects of the human experience. “We are a non-profit ethnic-based community organization that has a mission to assist all resettled Bhutanese refugees in Onondaga County of New York to integrate into mainstream American life, and become self-sufficient and self-reliant with good health and wellbeing.” — Ajaya Sapkota, Bhutanese Community in Syracuse, Inc. 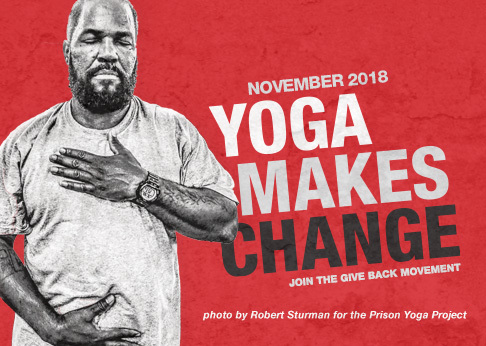 Mindful Yoga Therapy for Veterans 100-Hour Certification in Newington, CT •... Elizabeth Carling: Why Teach Yoga and Mindfulness in Prison?